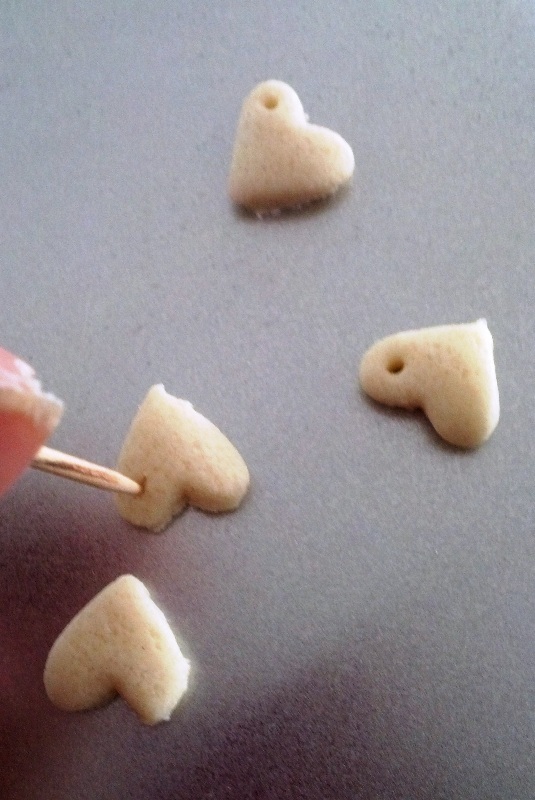 Salt dough jewelry – Valentine earrings! Judging from my previous posts, I’m in love with Valentine’s! Or is it that I’m in love with the idea of being in love? I’ve seen a ton of salt dough ornaments on Pinterest at Christmas time. The recipes to make them call for a lot of flour and salt. I’ll be sure to make some of those the next yuletide season. 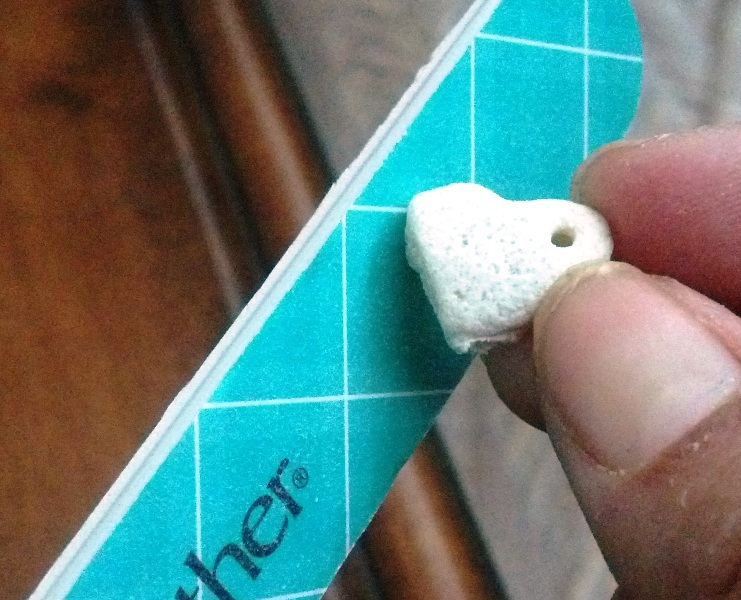 I have visions that every gift given from this household will have a precious salt dough ornament tag attached to it. Since I only want to make a few beads, I have a reduced the batch size significantly. -non stick aluminum foil (optional) NOT parchment. Parchment will absorb the moisture and make the dough hard to work with. 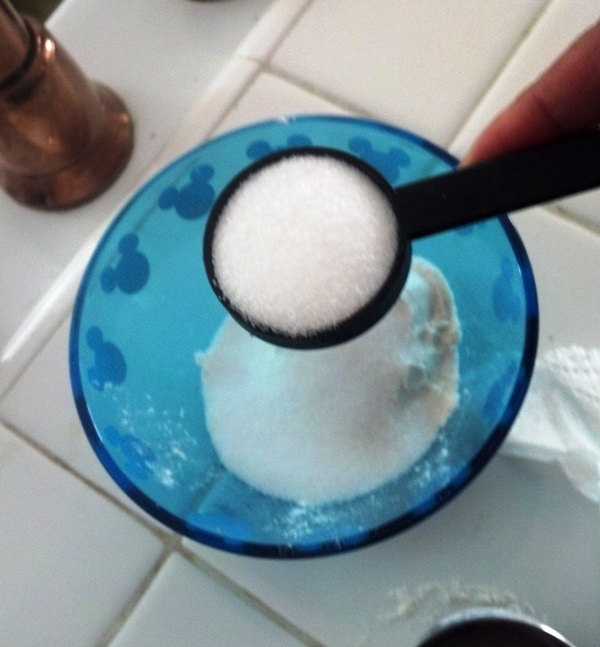 In a small bowl combine the salt and flour. Add a little water at a time while mixing. The dough should have the consistency of playdough. If it is too wet, sprinkle a little of flour on it. Roll out as evenly and flatly as possible to about 1/8th inch on to your work area lined with the non-stick aluminum foil. The foil is not needed if you feel your work area is a smooth area. Whatever imperfections you see on the dough, fix them. They don’t disappear and will show up on the final product. 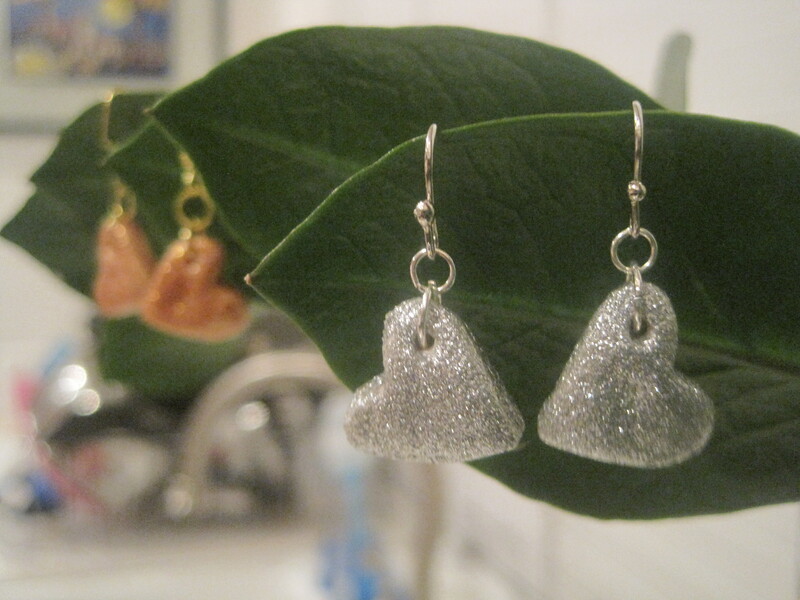 Punch out your hearts or other small bauble of your liking. I would choose something simple because it can get a little tricky to remove your bauble from one surface to another. The more intricate the design the more challenging to remove from your work area to dry. With a tooth pick, poke a hole close enough to the edge and large enough for a jump ring to go through. Make sure the dough is flat enough for this. I didn’t roll the dough quite as flat as it could have been and had a frustrating time getting the jump ring to fit without breaking the heart. With the spatula move your heart on to a baking sheet. Reshape and fix as necessary. Let air dry or place in the oven at the lowest heat setting flipping over every 1/2 hour or so until dry. Flipping is necessary ro prevent curling. In the oven, it could dry in an hour. Air drying would be 3-4 hours depending on the climate. File down any rough edges with the nail file or sand paper. Paint with glittery nail polish using many light coats and allowing it to completely dry between coats. Don’t get all crazy and blob it on! 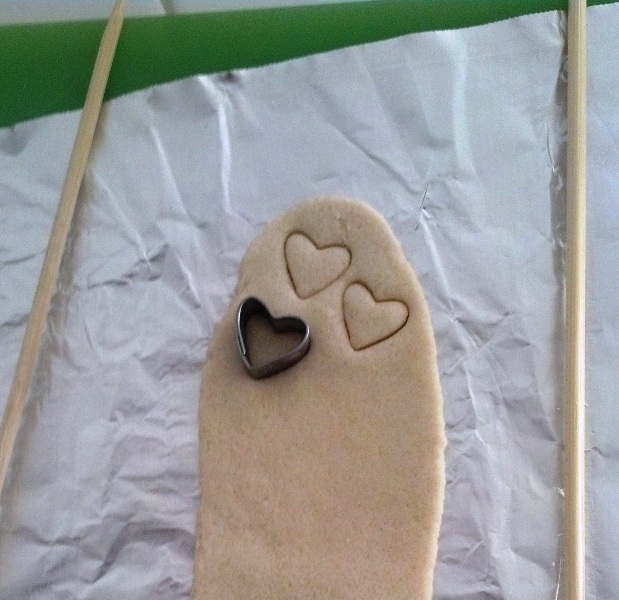 The moisture from the polish will soften the salt dough and unhappiness will result. Open up the jump rings, add the french hooks and your heart bead, close it back up. 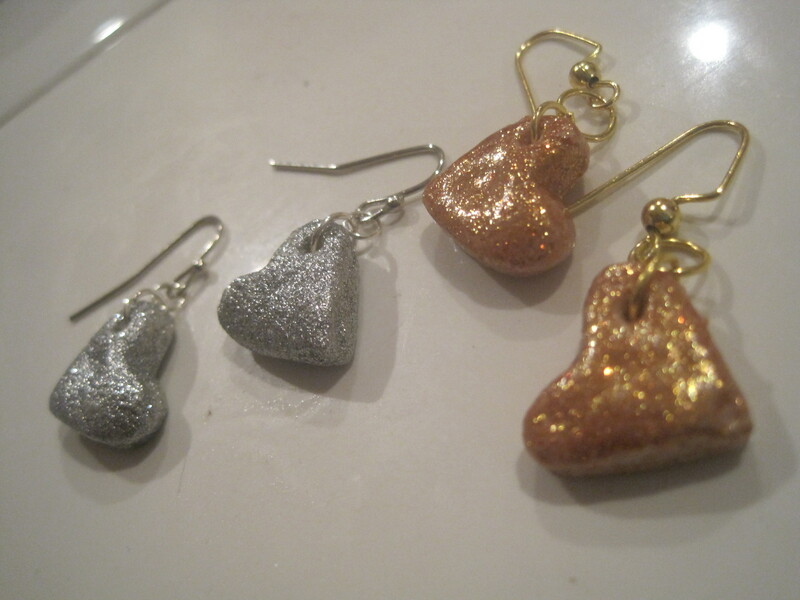 Salt dough heart earrings actualized! To télos! 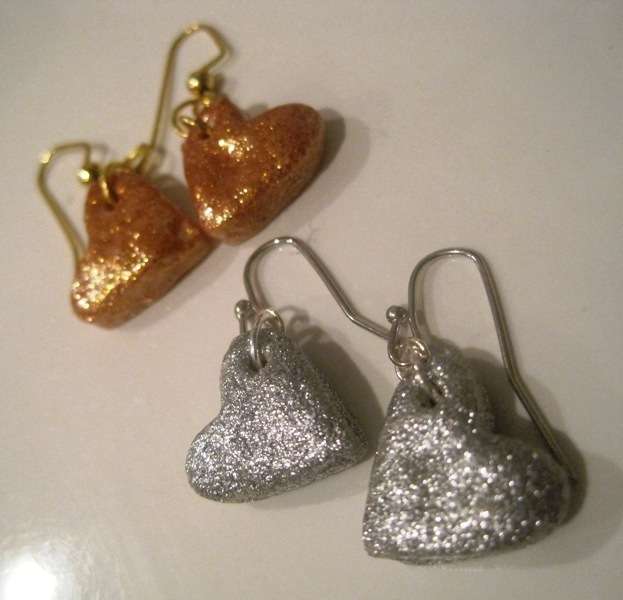 This entry was posted in Jewelry and tagged bead, earrings, heart, jewelry, salt dough, Valentine. Bookmark the permalink. ← Conversation Heart Tree – Another Dollar Tree Hack! 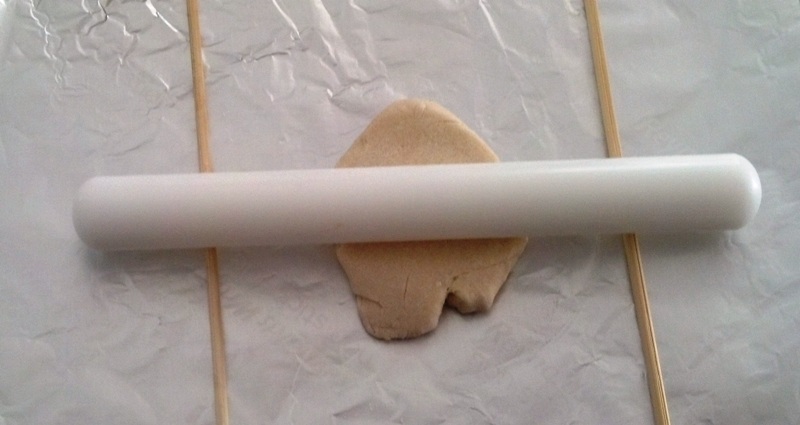 did your first round of salt dough baking make this time easier? This time I air dried them because they were so small and I really didn’t feel like turning on the oven. It took about 6 hours to air dry flipping them over every hour or so. In terms of this go around being easier… yes and no. Yes, because I had a small batch so I didn’t have to plan what was happening around making this craft (like “Am I going to need the oven to make dinner?”, “Will I need to baby sit the oven to check for dryness?”, etc.). No, because I didn’t roll it out as flat as I could have thus attaching the jewelry findings more challenging than they needed to be, and I still needed to hang around to flip them over, when it could’ve been dry much sooner had I used the oven. Lessons learned!